The pet-friendly Holiday Inn Express Suites Hillcroft is 11 miles from downtown Houston and comprises 111 guests rooms equally suited to the business or leisure traveler. Items included with the room rate at this five-story hotel are a hot breakfast buffet, high-speed Internet access, local telephone calls, in-room coffee, a morning newspaper and parking. There is one meeting room available for business or social functions that can accommodate 36 guests. Area landmarks and attractions include the Sam Houston Race Track, the Houston Silverado IMAX all-digital movie theater, the Space Center Houston, Bayou Place entertainment complex, the George R. Brown Convention Center and a Six Flags theme park. 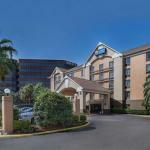 The hotel is 18 miles from William P. Hobby Airport and 30 miles from the George Bush Intercontinental Airport. All the guestrooms and 16 suites have a work desk with high-speed Internet access, television with cable news and movie channels, iron and ironing board, coffeemaker, two dual-line telephones with voicemail and speakerphone, and a hairdryer. Connecting rooms, rollaway beds and cribs are available. The suites and executive club level rooms have the benefit of a microwave oven and refrigerator. This inn has an outdoor swimming pool and a fitness center that is open 24/7. The complimentary breakfast is the only meal served here. Restaurants nearby include the Saltgrass Steakhouse, the Peking Cuisine Restaurant, an Olive Garden, Jack in the Box and a KFC. The 24-hour front desk has safe deposit boxes and information on area events and attractions. Other amenities include a business center, daily housekeeping, guest laundry, same-day dry cleaning service and ice and vending machines.